Last night, after a yummy vegan-friendly meal at a friend's house, I had to turn down dessert. And it's not because I'm counting calories. My friend Emma trotted out a strawberry shortcake she had baked for the occasion (I scooped up some strawberries to snack on), and my friend Vince produced a Hershey's "paradise pie," which I know to be insanely delicious. A week ago, I would have happily served myself a slice of each. But last night, as I watched everyone else indulging in the deliciousness of dessert, I thought to myself, "Aha! This is why vegans are so skinny." I have been sick for a couple of days, so I did not go to campus today. 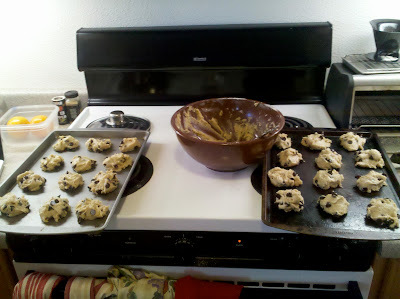 In addition to sleeping and getting work done, I decided to try my hand at baking. Since I never bake, I had to make a trip to the Isla Vista Coop for vegan ingredients (I seriously never bake, so I didn't even have any of the basics like flour or baking powder). I also picked up some powdered sugar to roll my strawberries around in for extra calories (if I'm going to avoid being a skinny vegan, I need to calorie-up my fruit, obviously). I chose it mainly because of the silly ladies in the video that plays automatically when you click the link. I imagine their names would be Pat (for the blond one) and Jill (for the frumpy brunette). Basically, the video is a big advertisement for the butter substitute Earth Balance. I am too poor to shop at Whole Foods, and I had just seen a pretty convincing commercial on Hulu starring Kim Cattrall for I Can't Believe It's Not Butter, so I went with that. Pat and Jill say to use ENER-G Egg Replacer, but I used my roommate Emily's wholeground flaxseed meal. It says on the package that one teaspoon of flaxseed + three teaspoons of water = one egg. Emily was kind enough to point out to me that this substitution would only work in baking situations, not, for instance, for scrambled or sunny-side up eggs. Thanks, Emily. I should have listened to what Pat and Jill were saying, though, because I forgot that when you're following a recipe, you need to look below the "Ingredients" list to the "Instructions." Whoops. I just dumped all the ingredients in a big bowl without thinking. I ended up with a depressingly powdery batter. It would have been impossible to scoop onto a cookie sheet, so I added a little bit of water at a time until it was manageable. 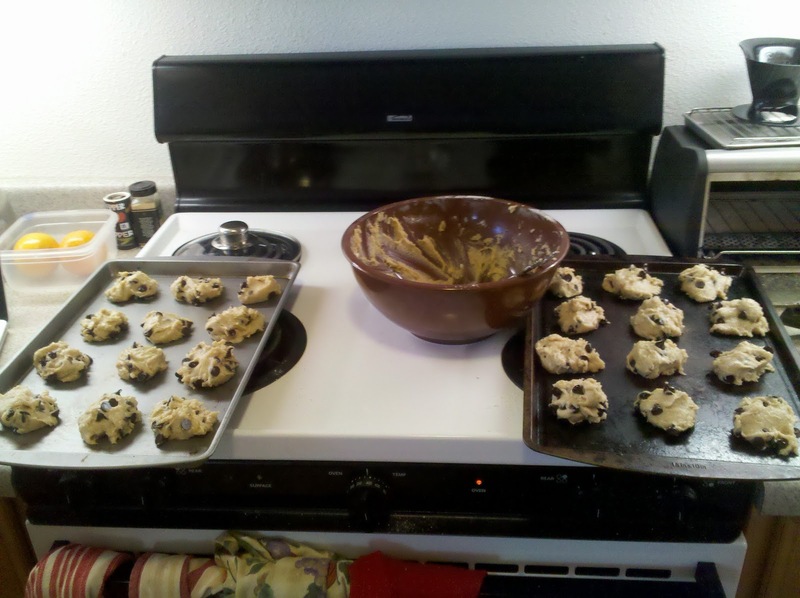 Then I followed Pat and Jill's directions to bake the cookies for 8-10 minutes (I went with 10 because my oven is ghetto and weak) and cooled them for a couple of minutes. And hooray! They are delicious-looking and kind of delicious-tasting, too. They are a bit more cake-textured than regular-people cookies. 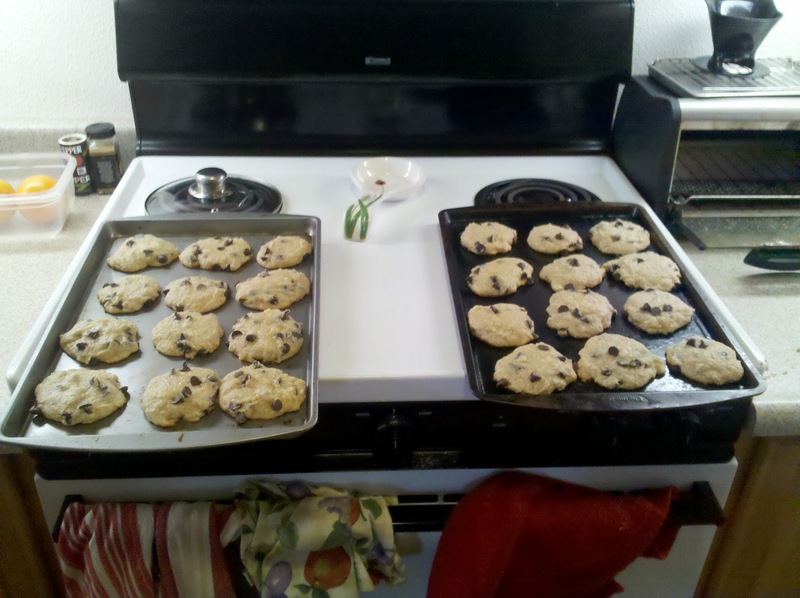 Now I have a lot of cookies, so if you live nearby and want to try one, come on over. Thanks for the shout out :) I'll be over for a cookie when I finish my glass o wine. No, seriously. And I'm wearing PJs. You have been forewarned. ooooooo delicious!! Another idea that might work (along the lines of yummy vegan dessert!!) is to take some phyllo dough (the kind made w/out eggs) and wrap it around some chopped up bananas w/ cinnamon or honey or peanut butter or chocolate chips or some combination of the above... bake and voila, deliciousness! Are you going full-on crazy vegan and avoiding honey? I know one particular vegan who doesn't even eat oranges because the peels are apparently rubbed with beeswax to make them shiny. Saloni: That sounds incredible! I couldn't find any eggless phyllo at Trader Joe's, but I'm going to look around other grocery stores. Thanks for the awesome idea(s). Kin: I haven't decided yet whether or not to cut out honey, but I think it's pretty common for vegans to avoid it (that orange peel hang-up, on the other hand, strikes me as bizarre). I bought some agave nectar, which is a honey substitute, and I'm going to see how I like it. I do like honey in tea to soothe my throat, so we'll see! I think I remember you telling me that you don't like coconut, but it seems like it's a big thing for vegans and I love it! Guess What I Wear as a Hat? A Lentil. What Do Vegan Zombies Eat? Grrraiinnzzz.